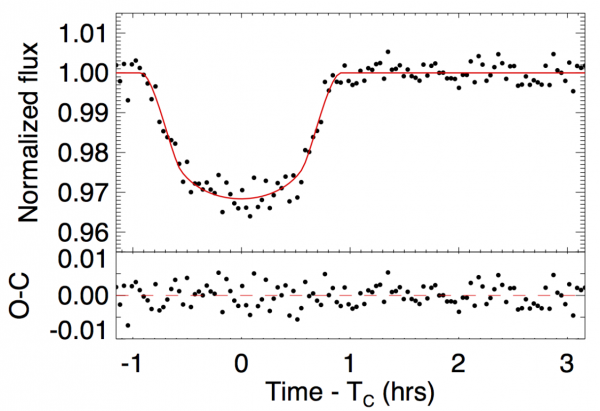 Read PSU Graduate Student Gudundur Stefansson’s Astrobite summary of the recent SPIE proceedings describing the MINERVA observatory. Penn State is a major partner in the MINERVA project, led by Professor Jason Wright’s group. Authors: Jonathan J. Swift et al. We can accomplish a lot on a small budget: Kepler cost approximately $600 million, which is low cost as far as space-probes go (JWST is estimated to cost more than $8 billion! ), but has found more than 3300 of the total 4800 planets (confirmed + candidates) to date! Dedicated Observatories are worth it: If you build a dedicated instrument to find planets, chances are that you will find some! Meet project MINERVA (MINiature Exoplanet Radial Velocity Array), a ground-based facility at the Fred Lawrence Whipple Observatory in Arizona, that sets out to do exactly this: a project solely dedicated to the detection and characterization of Super-Earths (planets with masses between Earth and Neptune) in the Habitable Zones of nearby bright stars, while keeping the cost down. In this paper the authors describe the philosophy and design of MINERVA, along with discussing some of the exciting first science results. The primary science goal is to survey a set of stars using the Radial-Velocity method – staring at a set of stars to record any perturbations in the host-stars’ orbit – to find and characterize Super-Earths. The secondary science objective is to obtain high precision transit light curves of a subsection of these planets. Once online, MINERVA will thus be the first US observatory dedicated to exoplanetary science capable of both precise radial velocimetry and transit studies! It is much cheaper. 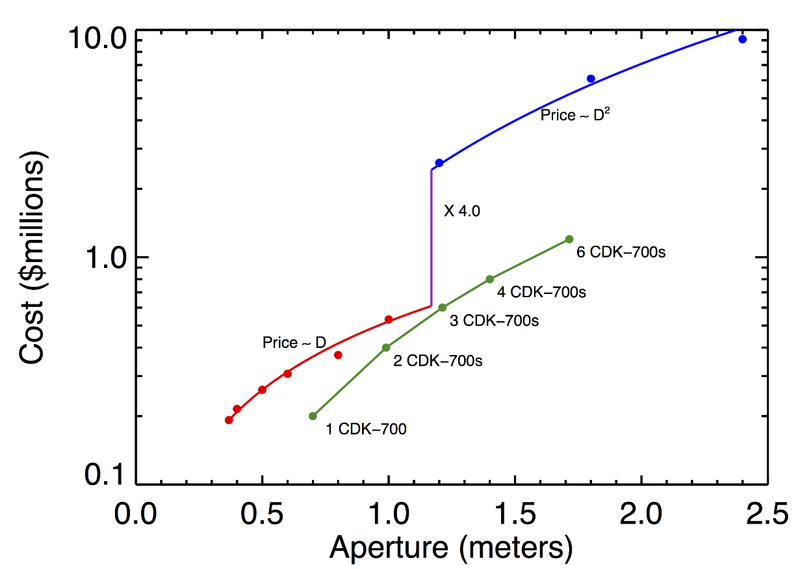 The authors conducted an informal survey of amateur high-end telescopes along with professional larger-aperture telescopes (see results shown in Figure 2). 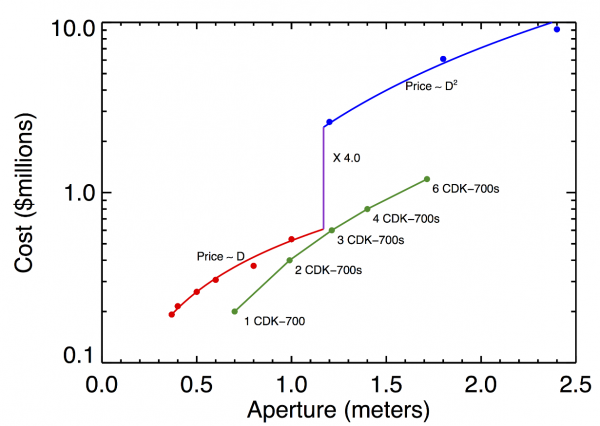 This revealed that using 4 commercially available (CDK700 0.7m from PlaneWave Instruments) is about 4 times cheaper than a single 1.4m custom-built telescope with the same light-collecting ability! The path to commissioning is quicker. 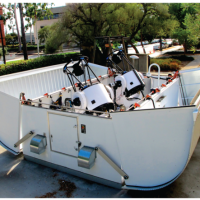 Buying off-the-shelf hardware, complete with control software, gives the team more time to focus on organizing and testing the telescope array as a unit, diminishing developmental risks. The spectrograph is smaller. The 4 telescope array will have a smaller étendue (a measurement of how “spread out” the light is in an optical system) which translates to a smaller spectrograph, which in turn is easier to stabilize thermally and mechanically. This reduces the cost of the spectrograph itself, and the overall operating cost of the facility. The spectrograph used for MINERVA – one of the only truly custom hardware components – is only touched on briefly in this article, but a publication that discusses it in detail is in preparation. It is easy to repair and even expand. In case of failure it is always good to be able to swap out things quickly to keep a long 3-year baseline program running! Furthermore, modularity means that expansion is straightforward. The authors are currently pursuing expansion opportunities that they call: MINERVA-red (infrared version), and MINERVA-South (in the Southern hemisphere). Another key element in MINERVA’s design is its fully robotic brain – The MINERVA Robotic Software (MRS) – that coordinates all operations of the facility. Night after night for 3 years, the 4 telescopes will automatically observe (weather permitting) a set of bright target stars in the solar neighborhood (around 80 in total), recording their radial-velocities. Obtaining these velocities with high precision and high cadence is key to successfully detect and characterize Super-Earths with the RV method. MINERVA’s precision of ~0.8m/s is not unprecedented, but achieving this precision every night – remember, MINERVA is a dedicated facility – is unique. As stated above, MINERVA will also search for transits of Super-Earths detected by the Radial-Velocity technique. Already, observations from the MINERVA test facilities in Pasadena have demonstrated the required photometric precision (sub mmag) of one of MINERVA’s Radial-Velocity targets. 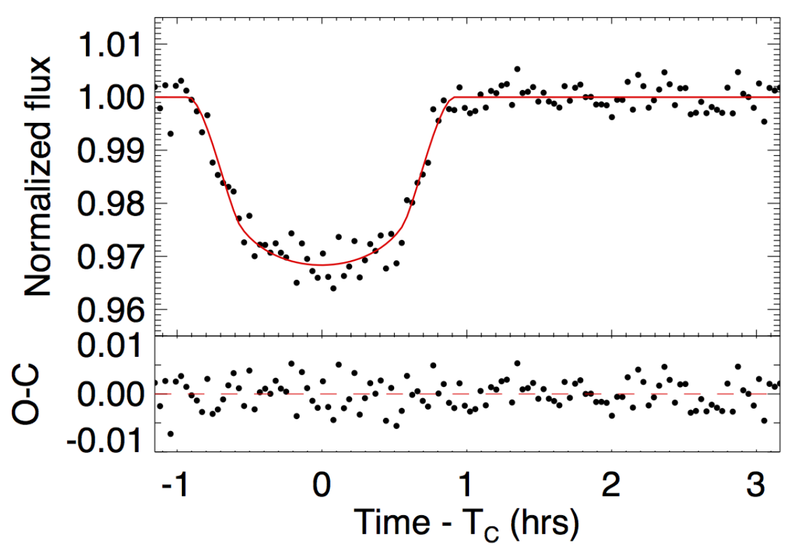 The authors also present new transit observations of WASP-52b (see Figure 3 ), a known hot Jupiter with an inflated radius, demonstrating that they can achieve their secondary goal of observing transits. Already, the on-sky performance of a subset of MINERVA’s equipment has been tested and validated. The authors note that there are still more milestones to reach before the start of full science observations in 2015. 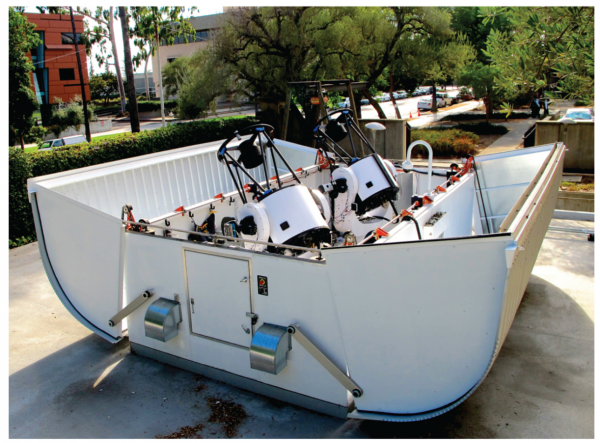 These include, further testing of the robotic software, and shipping of Aqawans 1 and 2 to the observatory in Arizona. The on-site integration of the spectrograph is planned in early 2015, and allowing for minor unforeseen delays, the fully robotic array will be up and running by mid-year 2015. Let’s hope everything goes according to plan!